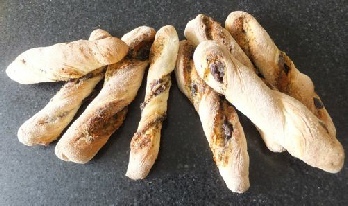 ﻿ Parmesan, Herb And Olive Bread Sticks. You will need a good non stick baking tray. Good sprinkling of Herbes de Provence. Place the strong flour in a bowl with the slat on one side of the bowl and the yeast on the other (do not let them touch at this point). Mix together and add the water. Mix until you have a good soft dough. If you think it looks a little dry, add a little more water. Tip out on to a VERY lightly floured board and using a scraper to keep scraping up the dough kneed until you have a non sticky, smooth dough. Place into a very lightly greased bowl and leave to prove until double in size. Meanwhile, mix together the olives, cheese and herbes. When the dough is ready tip out on to a surface lightly dusted with a mixture of flour and semolina. Flatten the dough into a rough rectangle about 2 cms thick. Spread over the olive, cheese and herb mix, press into the dough and then fold up the dough bottom to the middle and then the top half on top of that, press down firmly. Cut the dough into 10 strips. Dust your work surface with more of the flour/semolina mixture, twist each strip and roll with your hands until the length you require. Place on to a non stick tray (or line with parchment) cover with a clean tea towel and leave to prove for about 30 minutes. Place in the oven, lightly spray around in the oven with a water spray or place steaming water in a baking tray in the bottom. Bake for 10 - 12 minutes until golden brown.